No. 5016 shows up in the 1888 ORER. Clover House has dry transfer for this car. In addition to looking shorter car 5064 looks significantly longer to my eye, not just a foot. Of course, these are inside dimensions and there might be differences in the internal design of the two cars. Went back and checked some more. My earliest ORER is the June 1885 issue of "Sechrist's Hand-Book an Railway Equipment Mileage Guide"
The first series of BCR&N reefers is listed with and astrick that leads to a note the these are "Tiffany" reefers but to be reports as regular BCR&N rolling stock. Thanks Bob, Mike, and Howard for more input. Very much appreciated. More on the reefer car below. Been pretty busy of late: Long hours at work, some 6 day work weeks, music at church, etc. I've fallen behind on all my stuff I enjoy relaxing with, including threads here at the Early Rail forum. However, I'm down to 13 weeks left of hard labor ( ) on the railroad... followed by 4 weeks of paid vacation... then my never ending weekend begins! (Retirement!) Still much, MUCH more I would like to have accomplished before "R Day" hits... but the busy-ness level is what it is. More stuff continues to arrive, but I have yet to sit down and take the time to put together a Grandt Line order, or get some flex track ordered. Need to quit being so lazy after getting home in the evening and get to it!! Looks as though I purchased 7 Clover House reefer sets. I think I recall purchasing any reefer set from the 1880s. Yes, the set for the #5016 car is among them. That so: What are my cattle/stock car options that would look plausible/acceptable on an 1880s layout? I know that AHM/Mehano made a 34' plastic one (and I would prefer going the plastic route), but those seem to be made of gold when they hit eBay, which is rare. So far I have not coughed up the dough to get one for a "look see", then there's the "rare" issue to contend with, also. * Trout Creek - Nada. * Bitter Creek - Zilch. * BTS - A very primitive one, and also a peaked roof one that may have to "do". There is the Roundhouse one. It is perhaps more 1900 at 36' but could possibly be used. I have had one and the plastic was really nice. Sorry to say its discontinued. Thanks guys for some input. Yes, the Roundhouse 36' foot car is a nice model, though it's too big and modern to suit me "as is". And, being a cattle/stock car, it will be very difficult to cut down to make shorter on account of the slats and angle braces, I would think. I may have one of the Roundhouse cars "somewhere"... if I can find it I may take a look to see where the cuts would need to be made and what the resulting length would be if such was done. Oh wait, just happened to think, all mine have cast metal underframes. Just the thought of cutting down that cast metal underframe... ugh! It's a nice looking car. I did not see where the length is listed. Judging from its proportions, I would take a guess that it's 36' long. A bit expensive, especially by the time you throw in trucks, code 88's, and couplers. Unfortunately, I'm beginning to more fully grasp the fact that there ain't a quick n' easy way to add a few cattle cars to the roster!!! Ah well... it be's what it be. Labelle has a 36� stock car kit representing a 1900 prototype. Too big. Too recent. The BTS kit with roof is probably your best bet. I think it needs more details such as nbw�s and brake wheel. Etc. Well, in reality, I've still got a ton of work to do on existing "on hand" rolling stock projects, so I guess the "need" for cattle/stock cars is not exactly "pressing", but I did want to see what my options are and what I'm up against. You're right, I may have to resort to the BTS kit. Haven't accomplished much this weekend out in the Hobby Shack, but yesterday I finished readying a couple of Mantua gondolas, and just a few minutes ago finished readying one of the cut-down Bachmann gons. That's three more ready for paint/decals! Supper's now et, so now I'm getting ready to head back out there and work on another cut-down gon, this time a Pocher. However, I also sort of have a hankerin' to piddle with my track plan. We shall see which happens! You�re doing such a good job creating a fleet of boxcars at minimal cost and in reasonable time that a larger investment of both for a train of stock cars makes sense. On average you are doing a good job of building a roster at a good cost. A train of stock cars would be a signature feature of your layout. And so appropriate. Cattle transport could be very important to those western lines. Along this same line, at this point I only have enough Mantua "ventilated" boxes to make 4 reefers, I will also want more of those. At least enough to use up my Clover House reefer sets stash (7). Then there's the Bitter Creek Tiffany that I can use to add some variety, as well as shortening/lowering an additional Mantua or two. Changed my mind on the Pocher gon project. Didn't want to use some of the MDC queen beams/pedestals I have on hand on it, preferring instead to use the MDC's on the Bachmann boxcar conversions. (Those handy mounting pins!) I can use Grandt Line beams/pedestals on the gons. Do you like the AHM/IHC old time stock cars? They're about 33' and are patterned like the DRGW double deck N.G. stock cars. I have several squirreled away that I will let go of for $5.00 each plus shipping if you're interested. If you are let me know and I'll take an inventory and let you know what's available. That looks like a reasonable stock car. In fact it looks like the PRR 28� stock car in the CBD. Of course if they are lettered for the Union Pacific they will need new paint because UP is a downer for Andre. DEFINITELY interested. I just purchased one yesterday off the Bay for a "look see" but of course, haven't received it yet. From the pictures on the Bay, it looks to me that with just a bit of refinement, they'll definitely be "good enuf" for what I need them to do. Your offer sounds like a huge time saver for me compared to building a small fleet of stick-by-stick craftsman kits. If you have enough of them to form the backbone of the cattle car fleet, then I can use a couple of the BTS little cattle cars to add some variety. If you don't mind, go ahead and inventory how many you have and send me a note. You can use the PM feature here, or simply email me at laming at cebridge dot net. Thank you very much! "Of course if they are lettered for the Union Pacific they will need new paint because UP is a downer for Andre." 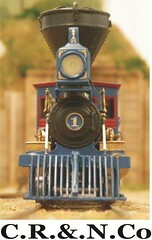 I'm not totally against the UP, in fact I think they had some pretty neat engines/equipment back in the 1860s - 1880s. However, I like the name "Kansas Pacific" much better for a primary connection 'cause I think it helps to better locate the locale/theme for my little freelanced endeavor. IF a road named the "Colorado & Pacific" connects with the "Kansas Pacific"... well... seeing that Kansas adjoins Colorado... and that as such it is an "east/west" thing... the hmm... maybe the C&P/KP are east/west oriented? Bingo! HOWEVER... "Union Pacific" is quite generic and the UP was very far-flung, so it would seem to me that it would be a bit harder for me to convey location/theme. Maybe I'm majoring in minors here? (Nahh, not me! ) Guess it could be as simple as the fact that I just seem to like the KP name better. Thought for the day: Do you realize R Day is LESS than 13 weeks away???? EEgad!!! Comin' at me fast now! Andre, I have six. 3 W&A (black), one ATSF (FLAT red), one Rio Grande (brown) and one Flat Red for your favorite RR the UP.